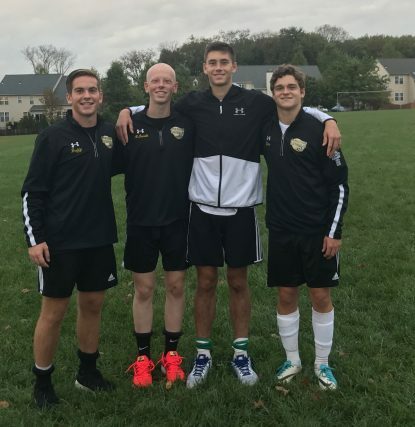 Joe Duffy, Matt McDonald, Chris Edling and Dan White of Lansdale Catholic’s soccer team, Oct. 7, 2017. The LC Crusaders stunned defending champion La Salle with a last-minute tie. This is the time of the year when many teams are in must-win mode. While the upper echelon has already secured a spot in the postseason, a handful of other programs are hoping just to make the playoffs. Because in the playoffs, one never knows what might happen. Conwell-Egan is one of two teams to come out of nowhere to make Catholic League soccer quite interesting. Heading into their regular-season finale 1 pm Saturday against visiting St. Joseph’s Prep, the Eagles’ last three games included a scoreless tie with Cardinal O’Hara, a 1-0 upset of Father Judge, and a 2-1 double-overtime victory over Bishop McDevitt. In particular, the clutch play of junior Paul Leible, sophomore Luke Jackson, senior Jack Barreras, and junior goalie Josh Anderson has catapulted the Eagles into a possible first-round playoff spot. Two of Leible’s goals have been recent game winners. He supplied the only tally in the win over Judge — the first time C-E has bested the Crusaders in 12 years — and he booted the sudden-death clincher versus McDevitt. Conwell-Egan isn’t the only Catholic League team opening previously closed eyes. Last week, Lansdale Catholic shocked the entire local soccer world when it tied La Salle, 1-1. The Crusaders had entered the contest with a 2-5- 1 record as opposed to La Salle’s 8-0. Lansdale Catholic followed that effort by tying fourth-place Archbishop Ryan, 1-1. Against defending champion La Salle, no one had given LC a shot, no pun intended. But trailing 1-0 with 10 minutes remaining in regulation, senior Chris Edling took a pass from junior Matt McDonald and tied the game. Senior goalie Joe Duffy and his defense, led by senior Dan White, preserved the tie all the way through two overtime periods. La Salle star goaltender Brett Werner, who has surrendered a measly three goals against Catholic League foes, was classy despite La Salle’s first Catholic League blemish. Cardinal O’Hara captured its fourth consecutive girls’ Catholic League tennis title with a 4-1 victory over Lansdale Catholic, the Lions’ third straight title triumph over Lansdale Catholic. Anna Marie Degnan, Caroline Lynch, and Jessica Dougherty took singles victories. Kenzie Gardler and Mary Clare Hayden did likewise in doubles. In the other doubles, LC’s Emily Handschuh and Katie Duffy prevented a clean sweep. Definition of a logjam? Consider Catholic League field hockey. With the final week of the season approaching, the standings are close. Bonner-Prendergast is in first place at 6-0, followed by Archbishop Carroll, Cardinal O’Hara, and Archbishop Wood all tied for second at 6-1. Teams five through seven — Little Flower, Lansdale Catholic, and Archbishop Ryan — are deadlocked at 3-4. Six teams will qualify for the playoffs. Quarterfinals take place October 27. The top two teams receive bye,s while seeds three through six do battle. The semifinals are scheduled for October 30, and the championship will be on either Nov. 1 or Nov. 2 at Neumann University.